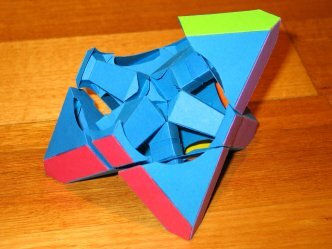 This is another Rubik's Cube-style twisty puzzle I made from cardboard. It is similar to the Dino cube, in that the vertices twist, but here they don't cut quite as deep, leading to more external parts. Again, the puzzle is very tempramental, and will jam and fall apart if everything is not carefully aligned, and even then pieces must be helped along their way. 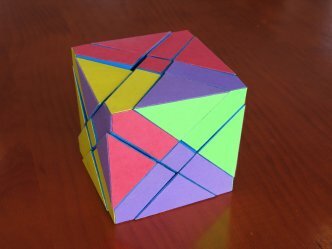 This puzzle was completed near the end of 2008 and as far as I know is the first with this design. The parts were all designed in Great Stella. The "Display->Show Intersections with Spheres" feature was used to show circular arcs on the nets. For the vertex parts, these showed where to cut tracks, and for the edge parts they showed how the curved arms should be attached. 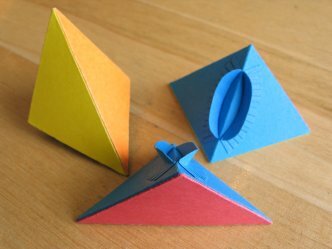 Here is an animation of the puzzle in action. 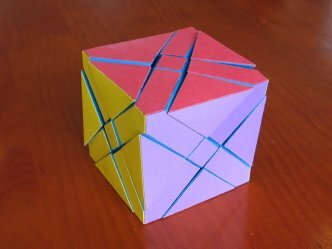 The puzzle after a single twist. 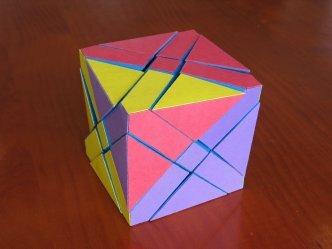 The puzzle after two twists. Here are some of the pieces involved in construction. During construction. 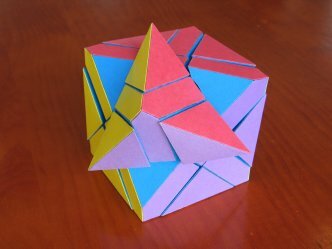 A central cuboctahedron has arms extending to the centre of each of the cube's faces, and also to the cube's vertices. The vertex parts rotate on these arms, and have circular arcs cut into them. This is where the edge pieces will hold on. 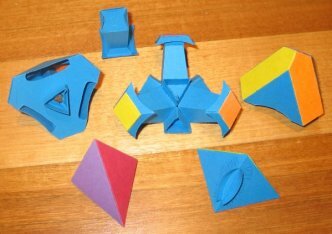 The face centres are immobile, the puzzle's twisting planes not deep enough to affect them at all. The edge pieces hold onto the vertex parts' circular arc tracks using curved arms.